Among London's street art curiosities are noses placed discreetly on the walls of Soho by artist Rick Buckley. There is a legend that if you see all seven, you will achieve infinite wealth. 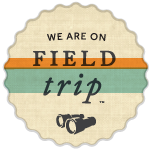 Having taken Pete Berthoud's Seven Noses walk, I'm eagerly awaiting my Premium Bonds cheque! Even if it gets lost in the post, however, the walk did bring treasures of a different kind: as well as the noses, we saw all sorts of Soho curiosities. My favourite was this wonderful pair of ghost signs in Soho Car Park. The first boasts the presence of a BP Energol lubrication bay, the second offers Regent remoulds as 'next best to new tyres - at half the cost'. 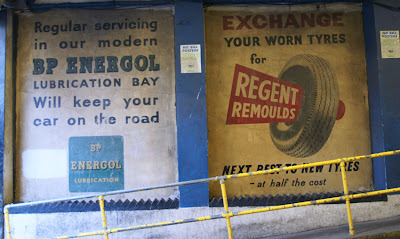 Anxious to attract the attention of the price-conscious motorist, Regent advertised at garages as well as offering their suppliers branded display stands with the cheery banner-and-tyre logo. 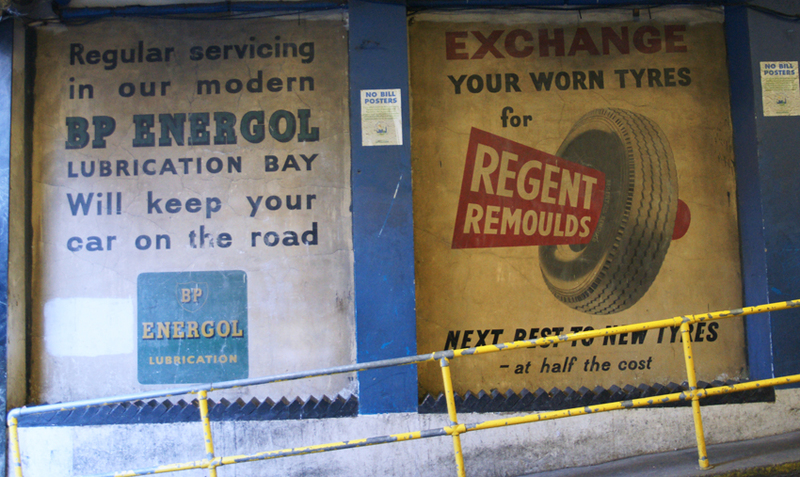 The Regent Tyre & Rubber Co, to give its full title, was in fact a subsidiary of Dunlop. Launched in the 1930s, it was highly successful and a factory was built in Manchester in 1947; others in Bristol and Glasgow followed in 1951. These are now closed; BP Energol, by contrast, is still available today. That brings back memories of working in Charlie's garage! We sold (and repaired) tyres and supplied remoulds for the price-conscious motorist! Definitely one of London's best, I wonder if the owners are keeping it safe or if they are ignorant of the interest these two signs generate... The life and times of BP's other well known Ghostsign here.